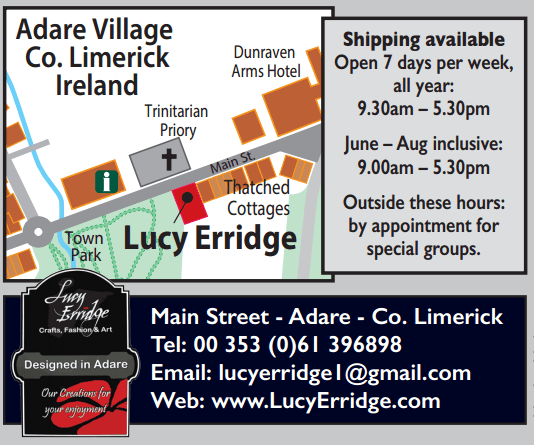 Lucy Erridge is Housed in a 200 year old thatched cottage in the charming village of Adare, Co. Limerick you will find LUCY ERRIDGE – Home of Irish Crafts Fashion and Art, a beautiful store, distinctive in all aspects. Step inside and there is a cornucopia of colour – an eclectic mix – designer goods for all discerning tastes …Knitwear, jewellery, textiles, decorative glass, ceramics, leather goods, together with accessories and homewear. High end yarns such as Cashmere and Alpaca are knitted into luxury garments exclusive to this store. Lucy designs many of the pieces and applies yarns and fabrics to create ‘one of a kind’ garments. She also works with suppliers and craftsmen to create distinctive pieces seen no-where else. We are situated directly across the road from the Trinitarian Priory. We are on the left if you are travelling from the Limerick direction, or on the right from the Kerry direction. There is street parking as well as parking to the rear of the heritage centre. Why not take a look at our virtual tour of the shop. Click the link below. We are open 7 days per week all year round from 9.30am – 5.30pm. From June to August inclusive we are open 9.00am – 5.30pm. Outside of these hours we do open by appointment only for special groups. We are delighted to say that we are currently working on a new online catalog for you to be able to browse a selection of our products online. We hope to have this up and running over the coming months. Please check back here soon!